While tourist numbers to Russia from Europe and North America fell, there was a 13 percent rise in the number of Indian tourists that visited the country in the first quarter of 2014. Bucking the general trend in the country, tourists from India, Brazil and many Asian countries are coming to Russia in increased numbers according to official statistics from the Russian Federal Tourism Agency (Rosturism). 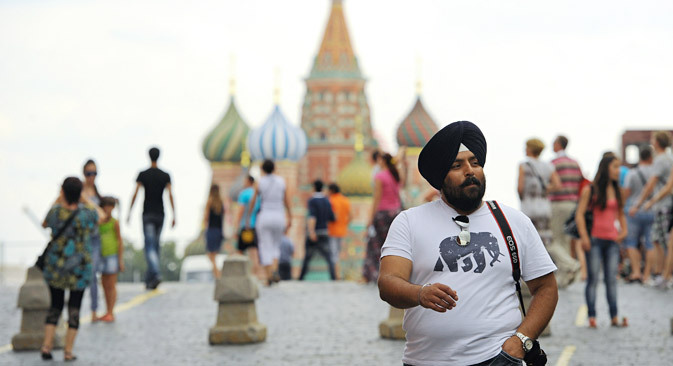 The number of Indian tourists that visited Russia in the first quarter of the year grew by 13 percent, while those from fellow BRICS partner Brazil grew by 11 percent. There was also a rise of 5 percent from China. “A growing number of Indians are keen to see the grandeur of Moscow, the beauty of Russia's ancient capitals Suzdal and Novgorod, and the grace of St Petersburg,” says Manish Synghal, Chairman of the Dimaz Group, which is an authorised intermediary of the Russian Consulate in Mumbai’s visa division. Synghal adds that greater awareness of Russia and the availability of services in English are also driving more people from India to consider a trip to the country. “In Moscow and St. Petersburg most of the places of tourist interest, supermarkets, hotels, restaurants and night clubs have English speaking staff,” he says. The number of tourists from South Korea has increased by 144 percent compared with last year, mainly due to changes in visa regulations between the two countries. Because of developments in Ukraine, the number of tourists coming into Russia has slumped. Since the start of 2014, the flow of tourists coming to Russia from key European countries has dropped by 20-25 percent and from Canada, the USA and Japan, by as much as 30-40 percent, managing director of tourist company Svoy TT Sergey Voytovich told RIR. He is convinced that the drop has to do both with political reasons (some tourists have been frightened off by the situation over Ukraine) and with visa difficulties. Other market experts confirm that there are negative trends in action. “Indeed, there is currently a considerable reduction in foreign tourists' interest in Russia, although it would be more appropriate to sum up the real outcomes at the end of the year,” says Moisey Furshchik, managing partner with FOK, a company specializing in regional tourism development programs. According to him, tourists' choices are very strongly influenced by the overall attitude to a particular country. In some countries, the events in Ukraine have resulted in a surge in anti-Russian feelings. Furshchik points out that for the majority of people, this is not expressed in any specific fears, like concerns for one's personal safety, fear that transport links may be disrupted or foreign currency banned. “It is just a general negative perception, formed by politicians and the media. In these circumstances, foreigners do not even want to study tour offers from Russia since there are so many other interesting places in the world where one could travel to right now. As a result, visits to our country are put off 'till later',” he says. However, when this “later” comes, it may bring an increase in interest in Russia. The expert is convinced that if the international political situation stabilizes and Russia's image abroad is restored, tour operators should try and make the most of this delayed demand. Then in three to five years' time there may be a gradual but considerable rise in the inflow of foreign tourists. “Naturally, it would require a strong advertising campaign and a targeted state policy. But at the moment any efforts to artificially boost an inflow of foreign tourists are likely to prove ineffective,” he is convinced. Co-chairman of the branding and regional promotion committee at the Russian Public Relations Association Vladislav Shulayev told RIR that difficulties with developing incoming tourism primarily result from the lack of a systemic presentation of Russia's opportunities outside the country. For the past 20 years, the regions' communication infrastructure has been focusing on domestic audiences. Russian regions have not yet become well versed in working with foreign audiences. This affects not only tourism, but also business and investment. All foreign experts that he has ever worked with say that people abroad have no idea of what Russia has to offer. The Russian Federal Tourism Agency has already announced plans to set up its branches abroad to promote tourism opportunities inside Russia.